Good Friday to you. It’s been some week of eating, both for me and for my Seattle Times colleagues. Need proof? See Providence Cicero’s review of Munchbar, dubbed the “new Bellevue-by-way-of-Vegas restaurant and night spot” in Bellevue Square. And check out Lynn Jacobson’s take on The Spice Room — a date-night-worthy Thai place in Columbia City. Need a drink and a nosh? Tan Vinh got happy at Mulleady’s Irish Pub in Magnolia (barrel-aged Negronis? the pipes, the pipes are ca-awl-ing!). As for me? I got that old-time religion again this year with the Monday night reading of a newfangled haggadah and plenty of fabulous foods at a Passover seder. There was chicken soup with matzo balls, roasted chicken, matzo roca and yes, controversy aside, we ate quinoa, a tweaked version of the nutted rice recipe from the original Silver Palate Cookbook — with the grain taking the place of the rice and the addition of dried cherries along with the raisins. There was also some fine wine, as well as the less sophisticated and cloyingly sweet ceremonial grape-juice of my childhood (talk about plagues). We laughed (oh, how we laughed! ), we sang, we ate, we recounted the story of the Exodus. Dayenu. Though I won’t be joining the masses at Qwest Field on Easter Sunday, I will be joining friends for leg of lamb at our annual Easter dinner since, as you likely know by now, I’m an equal opportunity enjoyer. Need a lamb recipe, a ham recipe, or an idea for a not-so-traditional but most delightful Easter cake? We’ve got you covered there. And if you’re wondering whether — and for how long — your hard-boiled Easter eggs are edible, you’ll find that answer right here. Have a sunny weekend (whatever the weather), keep the faith (whatever that means for you) and we’ll talk again next week. 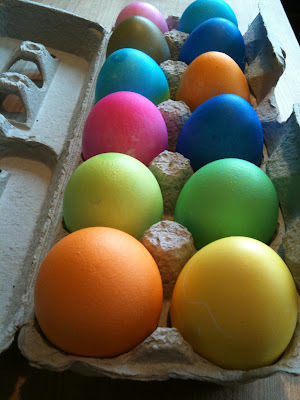 Dye, dye, eggs. Nu? Our Good Friday tradition.